Bring 3D models to life on iPad or iPhone using SketchUp Viewer. Navigate and present your own SketchUp projects, or explore the millions of free models in 3D Warehouse for FREE! That’s right, SketchUp Viewer is a FREE app (sign-in required)! Explore, present, and communicate in 3D. Here’s how: • Open or download models directly from 3D Warehouse or Trimble Connect. You can also open models using the iOS ‘Open In’ feature, for example when opening .SKP files sent as email attachments. 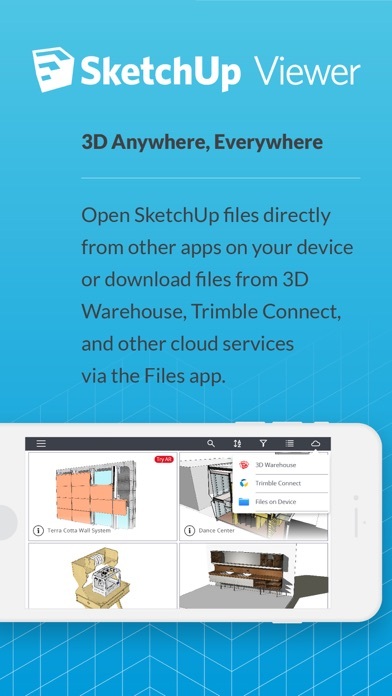 • SketchUp Viewer supports Apple’s Files app, making it easy to open models from Dropbox, Google Drive, iCloud and other file storage apps. 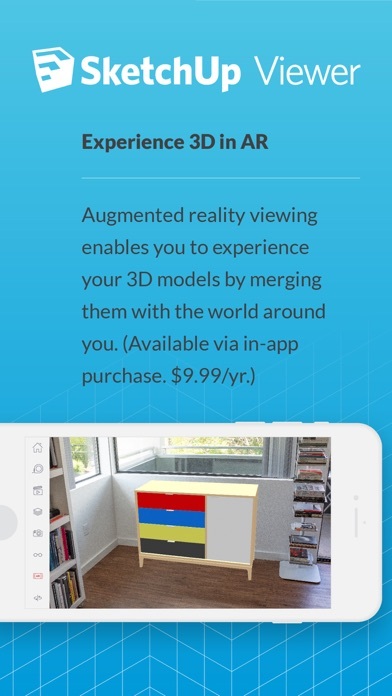 • Augmented reality (AR) viewing features enable you to experience your 3D models by merging them with the world around you. AR model viewing features are available for all SketchUp Shop, SketchUp Pro and SketchUp Studio subscribers (also available via in-app purchase. $9.99 USD/yr.) • With the Select tool and Entity Info panel you are able to get information about edge lengths, the area of faces, volume of solids, and component and group definitions. • Navigate using multi-touch gestures for orbiting, panning and zooming. • Choose to view your projects from any of the standard views or Scenes that you may have created up in SketchUp’s desktop and web modelers. * • Switch between perspective and orthographic cameras for production and architectural drawings. 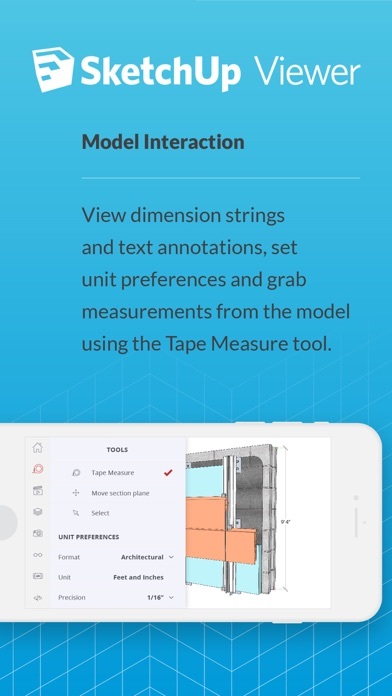 • Take measurements using the Tape Measure tool and adjust unit preferences to see measurements, dimension strings and Entity Info in the units of your choice. • Turn layers on or off to control the visibility of parts of your model. • Control the look and feel of your model by adjusting Edge and Face styles, including X-ray mode, along with toggles to control the visibility of Hidden Geometry, Section Planes, Section Cuts, Axes, and Watermarks. • Move existing section planes to get just the right interior view of models, or visualize important elevation and plan views. *The app supports the following scene properties: Camera location and properties, Hidden Geometry, Visible Layers, Active Section Planes, Standard Edge Styles, Face Styles, Background/Sky/Ground Style settings, Watermarks and Axes Location. 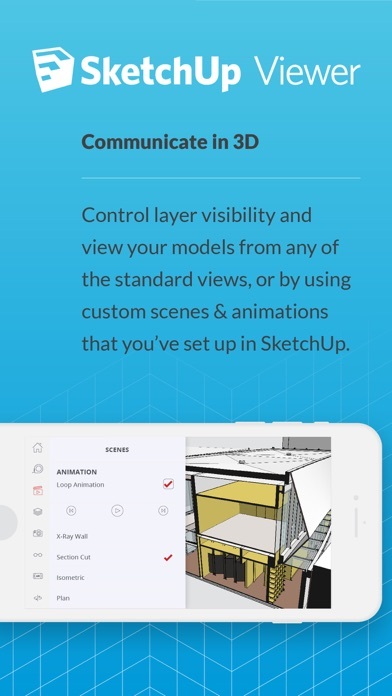 For information and instructions, please visit: http://help.sketchup.com/en/mobile-viewer This app is recommended for iPhone/iPad devices running iOS 11 or higher with a minimum of 1024Mb of RAM (Retina iPads or newer, iPhone 5 or newer). The AR feature uses ARKit and is compatible with iPhone 6s and newer, iPad Pro, or any 2017 iPad or newer, running iOS 11 or later. 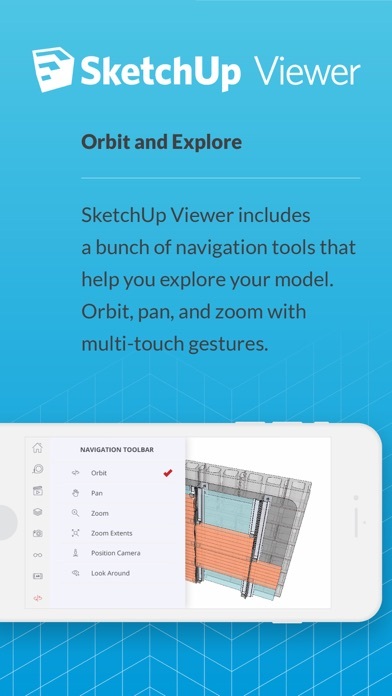 SketchUp Viewer offers premium, AR model viewing via in-app subscription at a price of $9.99 USD per year. Payment will be charged to your iTunes Account at confirmation of purchase. Your subscription will automatically renew unless auto-renew is turned off at least 24-hours before your subscription expiration date. Your account will be charged $9.99 USD for renewal within 24-hours prior to your subscription expiration date. You can manage your subscriptions at any time, and/or turn off auto-renewal, by visiting your Account Settings after your initial purchase is complete. Can’t log in. Another one bites the dust. Wow. Now I can’t work offline - need to login? Ok, go online, set up new account. Nothing: app does not go forward to wherever it’s supposed to for login. This does not work. First was MyMeasures, now SketchUp for iPad. I will not waste time anymore with the dreams of utilizing tablet-based versions of sophisticated programs. It is now a world of high-end, cloud-based BIM programs with expensive subscriptions. No more of this nonsense for me, it’s back to printouts, plans, pencil and paper. Calidad Top of the Line! Para mi, es el mejor visualizador de una herramienta de diseño gráfico!!! All I wanted to do was simply send a 3D sketch up file to a friend. When I realized that they would have to make an account just to open I file whether I text it to them or Dropbox it. The makers of Sketch Up need to realize that the users of this app are not the same as the users who make 3D models in the desktop app. All they want to do is view a model and spin it around. That’s it! No making usernames or passwords or any of that. Way to make a very simple task into a pain. Now it guess I’ll have to do a screen capture video to show them the design. 🙄😡 Thanks for nothing. It’s quite good except it’s hard to move around models and I often get stuck underneath the work plane the creator worked on or get stuck inside a solid structure the creator made, other than that it is great! I used to be able to use this app to view my files without worrying about having yet another account. The latest update forces me to signup in order to view my own files now. The app was already nothing more than a 3 star app before, but now it’s completely useless to me. Thanks Trimble for screwing up yet another aspect of SketchUp. Years of investments in time and money out the window because another greedy software company decided to milk its loyal users. I purchased this app and can no longer use it due to their subscription only model. Buyer beware! The ar is awesome as well as being able to view my files. Exception: As of updating my iPad to version 12.1.4, the app continually crashes. Developer needs to address this. I'm new to SketchUp and this app makes it possible for me to take and use my models wherever I go with my iPad. It works incredibly well and is kept up to date with the most recent version of SketchUp. Couldn't be without it.